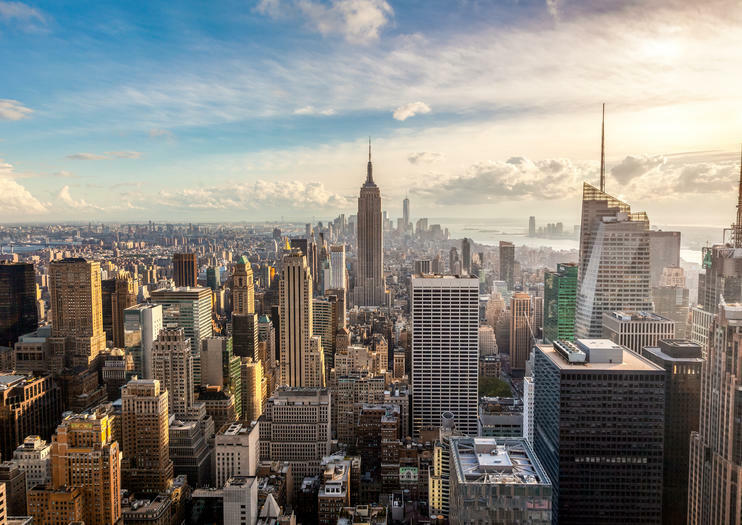 With just 24 hours in New York, you won’t be able to get through all the city has to offer—everything from museums to history-rich neighborhoods and plenty of nightlife—but don’t let that hold you back. You can take a satisfying bite of the Big Apple in just one day with some careful planning. See below for our suggested 1-day itinerary. Kick off your day at a museum—the Museum of Modern Art (MoMA), Metropolitan Museum of Art, and American Museum of Natural History are top-notch. Join an early-access guided tour to speed through collection highlights without crowds. Whichever museum you choose, you won’t be far from Central Park, where you can rent a bike for an introduction to the city’s green space. From there, head to the 70th-floor Top of the Rock Observation Deck, where you’ll find views of the Empire State Building, Chrysler Building, and Brooklyn Bridge. To see these and more landmarks up close, board a hop-on hop-off bus and ride by essential sights. Further south among the glossy highrises of Manhattan’s Financial District is the National September 11 Memorial & Museum. Book a Ground Zero memorial tour for an insightful experience and upgrade to visit the 9/11 Museum. Come evening, it’s time to enjoy a night out New York-style. With only one day, you don’t have time for even one bad drink. Instead, if you’re over 21, join a New York City bar crawl tour—perhaps one focusing on speakeasy-style cocktail joints in the East Village or one that visits New York’s rooftop lounges showcasing the city’s skyline. If you prefer the theater or have younger travelers in tow, opt for a Broadway performance instead. Disney’s screen-to-stage musicals are a hit with kids, and there’s never a shortage of shows playing Broadway. Take your New York City nightlife experience to new heights during this evening excursion to some of the city’s best rooftop bars and lounges. Check out Big Apple hotspots like Hudson Terrace, Sky Room, 230 Fifth and PH-D, following your insider host to three venues to dance, mingle and enjoy the trip’s included drinks (venue's choice). It’s a great way to hang out with the locals in a fun atmosphere while enjoying incredible New York skyline views. Your rooftop nightlife trip also includes cover charges, three drinks and transport between venues. Minimum age is 21 yrs due to licensing regulations. ID required. Dress code must be followed. Get early morning access to the MoMA in New York City with this Viator VIP tour. Beat the crowds at this popular attraction and arrive before the museum opens to the public for a 1-hour tour narrated by a museum guide. Greenwich Village, or simply the Village, is one of New York City’s most beautiful and famous neighborhoods. Take a guided walking tour of this legendary part of Lower Manhattan, an important landmark on the map of American bohemian culture. Learn how it became a birthplace of the ’60s counterculture movement. Hear about the famous artists who once lived here, from Edgar Allan Poe to Bob Dylan, Jimi Hendrix and countless others. Walk the winding streets and visit popular Washington Square Park, reliving more than 200 years of history. Step back in time to Prohibition-era New York with a tour of some of the Big Apple’s hidden speakeasies. During this 3-hour walking tour, a local guide will lead you to four tucked-away watering holes where patrons defied the national ban on liquor during the 1920s. Enjoy three vintage-inspired drinks and a bar snack while discovering the clandestine history of these rule-breaking East Village establishments. Minimum age is 21 yrs due to licensing regulations. ID required.